I just wanna remind everyone to join me on my Tag It Wednesday :) Click here to join! Hi everyone! I love rotating between making cards and mixed media projects. 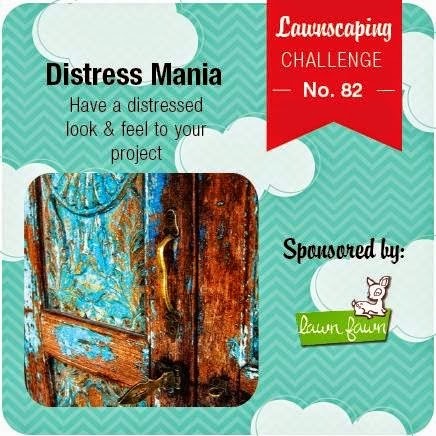 So here I am again with another card for the Lawnscaping Challenge. Click on the badge below to join. I have not done this technique on cards in a while and I'm excited to revisit this. I used some old Crate Paper (i believe) pattern papers that I still have and stamped the tag image from Lawn Fawn. The hearts are from Lawn Fawn too but the banner and sentiment are from Wplus 9. And the Baker's Twine. Love it Marina! you nailed the distressed look, and love those tiny hearts! OMG! This is amazing. I'm in love at first sight with this project! So cute!! Great vintage and sweet look!